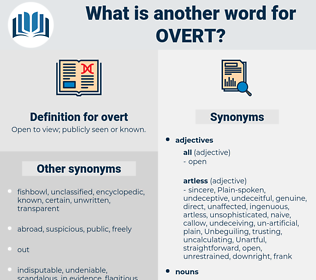 What is another word for overt? Open to view; publicly seen or known. 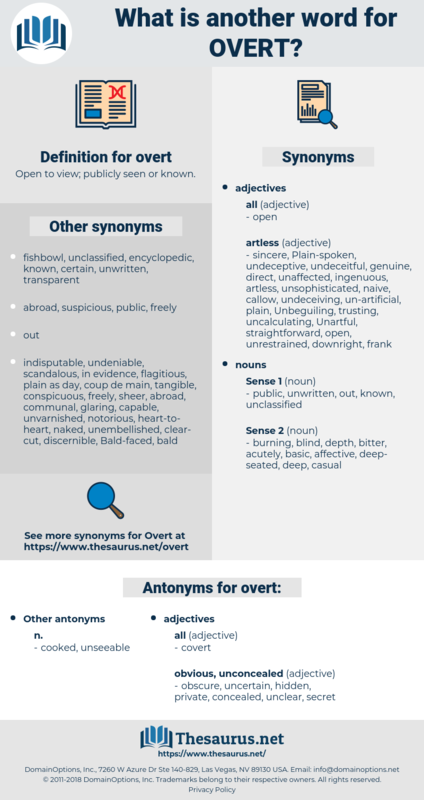 obvious, ostensible, transparent, outright, noticeable, undisguised, conspicuous, outspoken, gross, egregious, open-ended, disguised, flagrant, discernible, self-explanatory, self-reported, straightforward, demonstrated, open-minded, palpable, stated, receptive, unmistakable, brazen, self-evident, striking. masked, concealed, impalpable, unseen, imperceptible, impenetrable, invisible, obscure, undiscovered, dark, hidden, unknown, unimagined, hugger mugger, furtive, occult, latent, unthought-of. They looked at us a good deal, but ventured no overt guesses as to our antecedents. None of the four showed any overt sign of being impressed.